“True Blood” stars Anna Paquin and Stephen Moyer were married Saturday night in Malibu. Us Weekly reports that the actors exchanged vows in a tent on a private residence across the street from the beach. 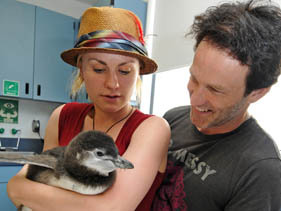 Paquin, 28, and Moyer, 40, began dating a few months after they began working on their HBO series…. August 21, 2010. Tags: Anna Paquin, Anna Paquin and Stephen Moyer marry, Stephen Moyer, True Blood. Celebrities, Charlaine Harris, Entertainment, Fantasy, Fiction, Horror, Mystery, Popular Culture, Supernatural, Suspense, True Blood, Urban Fantasy. 1 comment.